Hike into the wilds of Andasibe-Mantadia National Park, home to more than 300 species of orchid, 20 species of lemur and an astounding array of endemic species. Join a naturalist on a 4X4 ride deep into Isalo National Park to search for the iconic Ring-tailed Lemur and Verreaux's Sifaka. Spend three nights in the pristine and un-touristic coastal village of Anakao, learning about the local lifestyle and endemic flora and fauna. Separated from the African mainland more than 100 million years ago, Madagascar is a living laboratory of evolution. More than 80 percent of the island's flora and fauna, including over 100 species of lemur — the island's endangered and charming primate — exist nowhere else on earth. Among beautifully vivid extremes, from primary rainforest to sandstone desert, learn about natural history, critical conservation issues and the amazing diversity of this natural wonder. Afternoon: Arrive Antananarivo and have time to unpack, freshen up, and relax. The capital and largest city of Madagascar, Antananarivo – known as Tana by the locals – has been the island’s most important city for several centuries. Originally founded in the 1600s, the city was the capital of the Merina people’s kingdom, one of the 18 ethnic groups of Madagascar. With the influx of European diplomats, the Merina king declared Antananarivo the capital of the entire island, cementing the city as the economic, political, and cultural center of Madagascar. Dinner: At the hotel's restaurant, enjoy a 3-course, set menu meal, plus bottled water. Ample bottled water will be provided each day throughout the program. Evening: Orientation: The Group Leader will greet everyone with a warm welcome and lead introductions. We will review the up-to-date program schedule and any changes, discuss roles and responsibilities, logistics, safety guidelines, emergency procedures, and answer any questions you may have. We are fortunate to have as our Group Leader a knowledgeable expert who will also serve as our primary lecturer for most of the program. Free time is reserved for your personal independent exploration. Please note that program activities, schedules, and personnel may need to change due to local circumstances. In the event of changes, we will alert you as quickly as possible. Thank you for your understanding. Activity note: There are steep steps with a handrail that one must climb between the parking area and Ambohimanga palace. The grounds around Ambohimanga are uneven with tree roots, boulders and uneven cobblestones exposed in places, so one must pay attention when walking. Within the palace grounds, there are steps required to visit certain parts of the palace, but these can be avoided if desired. Breakfast: Hotel buffet consisting of a variety of cold cereals, fresh fruit, cold meats and cheeses, breads, pastries, and hot breakfast items such as eggs and sausage. Coffee/tea, fruit juice and water provided. Morning: This morning we will depart via motorcoach and drive approximately 1 hour outside of the city to visit the Royal Hill of Ambohimanga. At this UNESCO World Heritage site, we will be introduced to an important part of Madagascar’s history, learning about the rise and fall of the royal dynasty on the island, which was influential in Madagascar becoming a modern state. We will also visit the fortified royal palace there, viewing the spiritual sites, living quarters and royal burial tombs that are present on the hilltop. In addition, Ambohimanga’s position on top of the hill provides a panoramic view over the surrounding countryside, so we will have a good view of the patchwork rice fields and small villages below. Lunch: Set menu lunch taken at a local restaurant near Ambohimanga. Afternoon: This afternoon we will be driven back into the heart of the city to visit the Tsimbazaza educational center and museum for an overview of Madagascar’s flora and fauna, led by the Group Leader. The museum contains specimens of Madagascar’s unique wildlife, including numerous lemur and bird species, as well as a skeleton of the extinct, giant elephant bird. The museum also houses an ethnographic display that introduces the Malagasy culture through jewelry, photographs and tools used in everyday life. Activity note: Drive time between Tana and Andasibe-Mantadia National Park is 4.5 hours. Morning: This morning we will divide between enclosed, 4-wheel drive vehicles for the drive from Tana to Andasibe-Mantadia National Park, located on the eastern side of the island. Along the way, we will stop at Peyreras Reserve. This small reserve is home to numerous species of chameleons, insects endemic to the region and several species of snakes and amphibians, allowing us to see this wildlife up close. Lunch: At Feon’ny ala Lodge, en-route to the park, it will consist of a set-menu, two-course meal. Afternoon: We will continue with the final portion of our journey to Andasibe-Mantadia National Park. Once we have settled in to our rooms, the Group Leader will give an overview of Madagascar and its history. Dinner: At the lodge we will have a three-course, set menu meal. Activity note: Drive from the lodge to the Mantadia trailhead takes approximately 1.5 hours over very bumpy road. Hiking time and distances vary depending on where the wildlife is at the time; trails can be steep in areas with places of mud or sand. Breakfast: At the lodge we will enjoy a buffet including cold cereals and fresh fruit, and eggs can be ordered as desired. Tea/coffee and fruit juices are also included. Morning: In our 4-wheel drive vehicles, we will travel to the high-altitude rainforest in Mantadia National Park for a hike led by local park rangers. We traverse the trails in the park while keeping an eye out for the diademed sifaka and the black-and-white ruffed lemur; we may end up hiking off of the maintained trails into the brush in order to get a better view of the lemurs. Lunch: Picnic lunch taken in the park. Afternoon: After our picnic lunch, we will return to the lodge and have a bit of time at leisure. In the late afternoon, we will regroup with the Group Leader for a lecture on the natural history and biodiversity of Madagascar. Before dinner, we will drive a short distance for a night walk in search of nocturnal species. The walk is done along the paved road, and is completely flat. Highlights of the walk may include the woolly lemur, Goodman’s mouse lemur, and various tree frog and chameleon species. Activity note: Hiking time and distances vary depending on where the wildlife is at the time; trails can be steep in places with areas of mud or sand. The flat parts of the trail are often on cobblestones, which can be slick if it has rained. The drive from Andasibe-Mantadia to Tana is approximately 4.5 hours. Morning: From the lodge, we will board our 4x4 vehicles for a field trip to Analamazaotra Reserve, which forms part of Andasibe-Mantadia National Park. The reserve is home to a variety of wildlife that is found nowhere else in the world. Nine species of lemur live within the reserve, including the indri. Critically endangered, the indri is the world’s largest lemur standing at three feet high. Called the babakoto by the locals, traditional mythology holds the indri as a sacred animal to be revered. The indri lives in a small family of up to five individuals, including its mate for life. In addition to lemurs, keep an eye out for one of the world’s largest chameleons, the Parson’s chameleon, which grows up to two feet long and is bright green. At the conclusion of our hike, we will return to the lodge in the late morning. Afternoon: Following lunch, we will depart in our 4x4 vehicles to a nearby private reserve for an opportunity to see several species of lemurs up close. Some of the species you’ll see include the eastern grey bamboo lemur, white-ruffed, and common brown lemurs. From the reserve, we will be driven back to Tana for an overnight stay. Dinner: At the hotel in Tana, it will consist of a set menu, three-course dinner. Activity note: The charter flight to Isalo National Park is approximately 2 hours long. Breakfast: Buffet breakfast at the hotel. Morning: This morning at the hotel we will hear a presentation by a local lemur researcher, who speaks to the group about her research on the Crowned Sifaka and what she is doing to help protect the species. Following the presentation, we will board our motorcoach for the transfer to the Tana airport, where we will board our charter flight direct to the dirt airstrip near Isalo National Park, departing in the late morning. Lunch: Taken at the lodge in Isalo, it will be a 3-course set menu, plated meal. Afternoon: Upon an early afternoon arrival at the airstrip, we will be met for the very short drive to the lodge. Settling into our rooms, we will have a chance to explore the lodge’s property on our own, which includes hiking trails, swimming pool, tennis courts, a spa and an equestrian center. In the late afternoon, we will board our motorcoach for a short drive to the Isalo Interpretation Centre, which hosts information and displays on how the park was formed, the people that live around the park, and the wildlife found in the national park. Back at the lodge, our Group Leader gives a lecture on education and public health in Madagascar. Dinner: At the lodge we will have a plated, three-course meal. Activity note: Namaza Canyon is a gentle hike of about 30-45 minutes one-way, with a roundtrip mileage of around 1 mile to the campground where lemurs are commonly spotted. Participants can choose to walk farther up the trail to a waterfall, but the trail climbs steeply after the campground. Total roundtrip mileage for the waterfall is 2.5 miles. Breakfast: Breakfasts at Relais de la Reine include a plate of fresh fruit, basket of toast and French-inspired pastries, and either eggs cooked to order or a traditional Malagasy stew. Tea/coffee and fruit juices are also included. Morning: Boarding our motorcoach, we will drive to the park entrance, where we will visit a local public school and have a chance to meet some of the students and teachers (when school is in session). From there, our motorcoach will take us into Isalo National Park to the Namaza Canyon trailhead. In the company of a local park ranger, our hike takes us into the canyon along a dry, and largely unshaded, trail to a campground where lemurs are frequently spotted. In the canyon, we will find Madagascar’s most iconic lemur – the Ring-tailed lemur – as well as the red fronted lemur. From the campground, there is an additional, optional, hike further into the canyon, where the trail climbs steeply up to the idyllic Cascade des Nymphes, or Nymph Waterfall. Here it is common to swim in the pools at the waterfall’s base. Lunch: Picnic lunch in the park, eaten at the Namaza Canyon campground. Afternoon: On the way back to the lodge, we will visit a local village where we meet the headman and learn about the everyday lives of people in the area. When we return to the lodge, take this opportunity to freshen up before we regroup. The Group Leader will lead a presentation on the various ethnic groups of Madagascar. Activity note: Roundtrip mileage for the hike to the natural pool is approximately 4 miles. The path climbs steeply at the start for about 30 minutes before reaching a long flat hike across the plateau; there is little shade along the way. The path then descends gently before reaching the natural pool; to access the pool, a short but steep descent is necessary. Morning: Entering Isalo via motorcoach, we will hike up the park’s plateau to the natural swimming pool, or La Piscine Naturelle, enjoying spectacular views of the escarpment and plateau. The cool water in this oasis is lined with palm trees and a cascading waterfall. There are no lemurs in this area of the park, but you will see many amazing species of plants lining the unique rock formations, as well as burial sites of the Bara tribe. Lunch: Late lunch taken at the lodge. Afternoon: We will have some time at leisure following lunch. In the late afternoon, we will see a performance of traditional song and dance, held in a most spectacular setting. Activity note: The walk in Zombitse is approximately 1.5 miles on a flat, sandy trail with plenty of shade. At the arboretum, the walk is on flat and even terrain, for no more than 1 mile. Total drive time from Isalo to Tulear is approximately 4 hours. Morning: Boarding the motorcoach, we will begin the drive to Tulear. Along the way, we will be able to see tombs of the Mahafaly and Masikoro people, both of which are ethnic groups that live in the area. The Mahafaly commonly bury their dead chiefs and kings in stone squares that are topped with wooden sculptures and zebu (a type of cow) horns. Large amounts of zebu horns and sculptures indicate a more important occupant within the tomb. The Masikoro tombs tend to be very ornate, with one tomb even in the shape of a warship! About 1 ½ hour’s drive from Isalo, we will stop at Zombitse National Park, which protects the dry deciduous forest and the abundance of biodiversity within that forest, for a walk with local experts. Zombitse is an essential transition zone between the arid and more humid areas of Madagascar, and also stands as a stark example of the deforestation problem on the island, being one of the few remnants of deciduous forest left. Here, we will embark on an hour-long walk in search of the unique biodiversity in the area. Highlights include the Verreaux’s sifaka, Hubbard’s sportive lemur, and a variety of bird, butterfly, reptile and amphibian species. Lunch: Boxed lunch provided, eaten at the Zombitse picnic area. 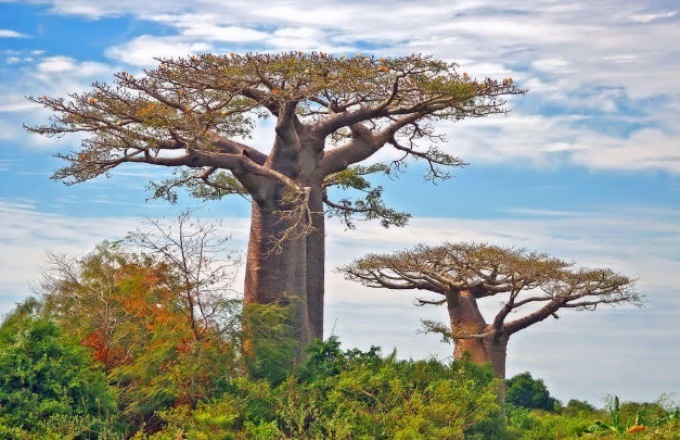 Afternoon: Making our way to Tulear, we’ll see baobabs on either side of the road; Madagascar boasts seven of the eight baobab species in the world, making this tree one of the island’s most iconic flora. Included in Madagascar’s flora are the unique, thorny Didiereaceae, a small family of cactus-like plants found only in the arid southwest. Many of these species, along with numerous euphorbia and kalanchoe, are represented at the Arboretum d’Antsokay, which we will visit in the company of a local expert just before reaching Tulear. Once at the hotel, we will have time to freshen up before dinner. Dinner: At the hotel, enjoy a three-course, plated meal. Activity note: Drive time from Tulear to Ifaty is approximately 1 hour. Breakfast: At the hotel we will have a plated meal, with eggs cooked to order. Tea/coffee and fruit juices are also included. Morning: We will start the morning with a visit to the Oceanographic Museum run by the University of Tulear. The museum displays the variety of marine life present in the Mozambique Canal, including corals, sponges, fish, tortoises, mollusks and a collection of shells. Of special interest is a specimen of coelacanth measuring nearly five feet in length, which was captured near the fishing village of Anakao in 1995. Coelacanths were once only known through fossil records, the oldest of which dates back approximately 360 million years, and they were thought to have gone extinct some 65 million years ago in the time of the dinosaurs; that theory changed when the first living specimen of coelacanth was found in 1938. Now, there are two known species of coelacanth, one that lives in the Western Indian Ocean waters, and another species found near Indonesia. From the museum, we will be driven in our motorcoach north along the coast to the village of Ifaty, where we spend the next two nights. Lunch: At the hotel, enjoy a plated meal. Afternoon: In the afternoon, we will visit a local Vezo fishing village to see how the locals live and work. We are likely to see examples of the traditional dug-out boats that are still made by hand today. In the early evening before dinner, we will regroup with the Group Leader for a lecture on conservation in Madagascar. Dinner: At the hotel, enjoy a plated meal. Activity note: Walking trail in the nature reserve is flat and approximately 1.5 miles in length. Breakfast: Light snack prior to morning activities, then full breakfast in the late morning at the hotel. Morning: An early morning start will take us to Reniala Nature Reserve, located just a short drive from the village of Ifaty, for a morning ecology walk in the company of our Group Leader and a local expert. This small, private reserve protects the native spiny forest, and is also a hot-spot for birding. Two species of endemic, threatened birds are found here: the long-tailed ground roller and subdesert mesite. Both species’ entire global range consists of a narrow band of coastline some 100 miles in length, and extending only 30 miles inland. In addition to these two extremely rare birds, Reniala hosts numerous other bird species such as the sickle-billed vanga, Archbold’s newtonia, white-headed vanga and Madagascar harrier hawk. Amongst the various endemic spiny forest plants, we will find the largest baobab in the Ifaty area, which is believed to be 1200 years old with an impressive girth measuring more than 30 feet. Near Reniala is the Village des Tortues (Tortoise Village), where over 1000 radiated and spider tortoises are protected. Here, we will learn the story of these endangered animals and how they are being conserved. Lunch: Lunch at the hotel. Afternoon: Free Time. Take this opportunity for personal independent exploration to see and do what interests you most in Ifaty. The Group Leader will be happy to offer suggestions and give directions. Enjoy a lazy afternoon on the beach or choose from a variety of activities offered at the lodge. Activity note: Air Madagascar frequently changes their flight schedules, so timing and activities on this day must be flexible. Drive time from Ifaty to Tulear is 1 hour. Flight time from Tulear to Tana is approximately 90 minutes. Morning: We will board the motorcoach to Tulear for the first portion of our transfer back to Tana. From theTulear Airport, we will take an Air Madagascar flight to Ivato International Airport. Lunch: Taken at a local restaurant. Afternoon: As time allows, we will explore the city of Antananarivo via motorcoach, including the historic upper part of the city and downtown. In the upper part of Tana we will disembark from the vehicle to visit a few significant churches with the Group Leader and our local expert, as well as take in the view of the lower city from a scenic point. We will be able to view the Rova of Antananarivo, a royal palace complex with structures dating from varying historical periods, and the Andafiavaratra Palace, also known as the Prime Minister’s Palace, as we pass in our motorcoach. Dinner: Farewell dinner at a local restaurant. During our meal, enjoy a performance by a local band that showcases the cultural aspects and traditional dancing of various ethnic groups in Madagascar. They use traditional Malagasy instruments such as the Valiha and the Kabosy while dressed in the traditional garb of each ethnic group. Morning: Departing via motorcoach with our Group Leader, we will visit a local family co-operative that makes silk scarves, a craft that has been handed down through four generations. We will have the opportunity to see how the scarves are made, from the cocoon all the way to the finished product. At the end of our field trip, we will board the motorcoach and transfer to the airport. Lunch: At a local restaurant near the airport. Afternoon: Our program concludes at the airport in Antananarivo. If you are returning home, safe travels. If you are staying on independently, have a wonderful time. If you are transferring to another Road Scholar program, detailed instructions are included in your Information Packet for that program. We hope you enjoy Road Scholar learning adventures and look forward to having you on rewarding programs in the future. Morning: Morning arrivals in North America. Situated on a hillside in the heart of the “City of One-Thousand Warriors,” the Royal Palissandre Hotel opens its doors with Malagasy hospitality. Full of elegance and warmth, its location provides stunning views. The Vakona Forest Lodge sits in the heart of the forest, surrounded by lush gardens. The unique rainforest setting provides for exceptional fauna and flora, with a variety of birds seen from the comfort of each room. Each of the 28 bungalows are spread out in the hillside gardens that surround the lodge's main area and restaurant. The main lodge area is circular, with a roaring fireplace at its center, providing heat to fend off the chilly evenings. Ideally located in the suburb of Ivato, not far from Antananarivo's international airport, the Relais des Plateaux provides comfortable accommodation in a convenient location. The hotel prides itself on responsible tourism, sourcing its food and decor from local providers, and relying on local staff as employees. Hotel Relais de la Reine offers fantastic panoramic views of Isalo National Park. Using natural materials, the beautifully-designed lodge has been built to blend in with the dramatic landscape in which it sits, incorporating the natural rock formations into its architecture and planning. The newly-opened Moringa Hotel is conveniently located in Tulear center, with views overlooking a town square and private garden. The hotel's restaurant is located on the top floor, with views over the surrounding buildings and garden. The lovely Les Dunes d'Ifaty Hotel, on the southwest coast, is nestled amidst indigenous tropical flora of Madagascar and overlooks the beaches and turquoise waters of the Mozambique Channel. Guests enjoy the open concept of the main building, which hosts reception, the lounge, main bar and kitchen, as well as the swimming pool with reclining beach chairs and umbrellas. The grounds of the hotel and nearby forests are perfect for exploring - baobab trees, rare birds and all sorts of endemic species inhabit the area. A short walk down a wooden boardwalk leads guests to the beach. Lalaina grew up in Antananarivo, the capital city of Madagascar. After receiving his degree, he worked with Zà, a Malagasy adventure company, since its inception in 1997. Lalaina leads various types of educational explorations including cultural, birding and wildlife adventures. During this period, he has also had the opportunity to work with such renowned educational experts as Hilary Bradt and Nick Garbutt. He is based in Antananarivo with his wife and his five-year-old son.